SW winds kept all boats docked today. Warmer weather and calmer winds should allow charters to get out by Sunday - with temperatures forecast to be in the 70's! We're looking forward to more Spring-like conditions. Sending out lots of love and good wishes from all the fishes at Hatteras Harbor Marina! We had a boat fish offshore today with a happy couple celebrating Valentine's Day. 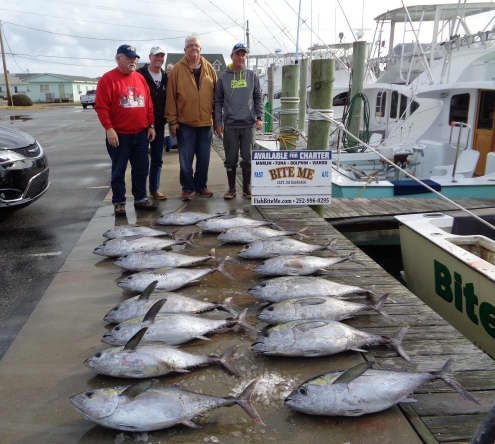 They returned early with a real nice catch of Blackfin Tuna. It's been a rather damp, blustery day with warmer weather expected later this week. Scott Burrows of Westminster, MD: 24 lb. and 26 lb. Blackfin Tuna on Tuna Duck. Joy Caspers of Westminster, MD: 24 lb. and 26 lb. Blackfin Tuna on Tuna Duck. So warm today! Temperatures were pushing close to 70 today with a light breeze. No boats were fishing today but several captains were on their boats working on getting ready for their next anglers. That could be you so give us a call 1-800-676-4939. South winds brought much warmer temperatures along with some rain showers. 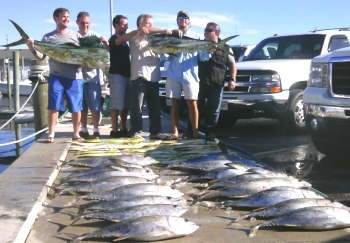 One charter fished offshore today and were rewarded with a dozen to twenty nice size Blackfin Tuna. 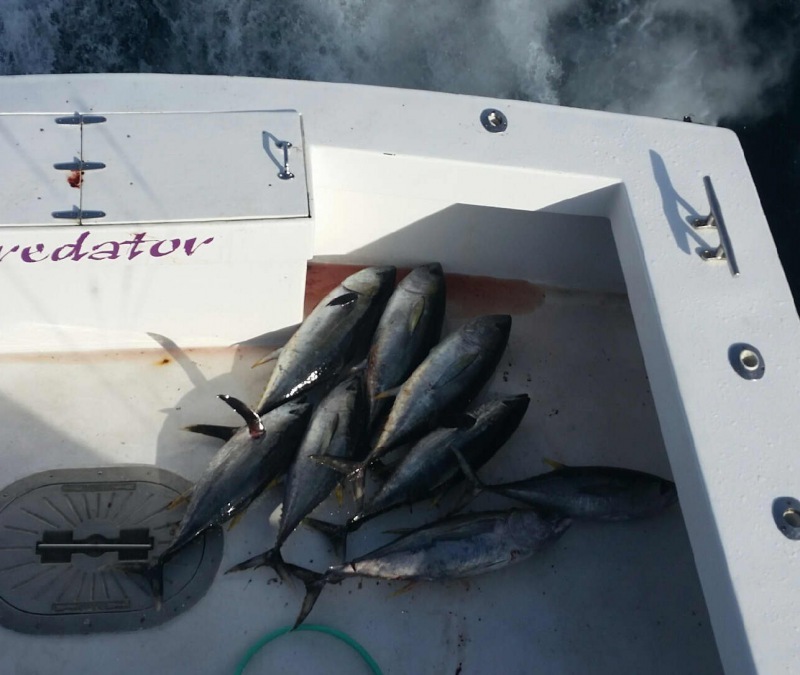 Sounds like the tuna has been waiting for anglers to get out and throw some bait in their direction! Mild temps are predicted this week with chances of showers each day. Don't miss out if you're on the island - February is a great time to venture to the Gulf Stream. We finally had an offshore charter that managed to get out and fish! It has been a while. Winds blew from the northeast making for a considerably rough ride, but they persevered and made it back with a nice jag of Yellowfin Tuna. The weather is supposed to warm up but it will be accompanied by several days of rain. 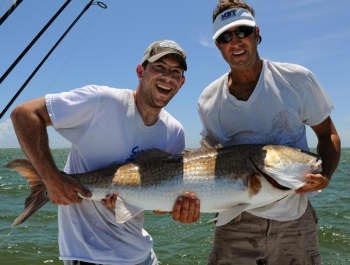 Don't miss out on your chance to go fishing - we offer inshore, near shore, and offshore charters. Give us a call at 800-676-4939 and we'll be glad to hook you up! We had a commercial boat head offshore this morning. 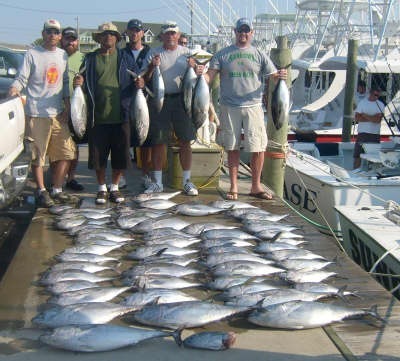 He reported some Yellowfin Tuna and stated that he broke a Bluefin Tuna off and lost it. Warmer weather is forecast for this weekend along with some rain. Interested in fishing? 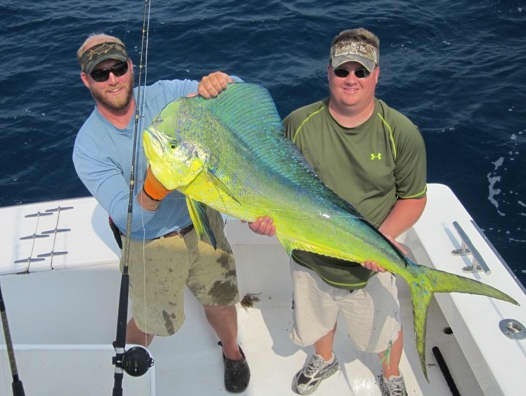 Give us a call at 800-676-4939 and book the fishing adventure of your choice! Excellent bottom fishing today with Triggerfish and Sea Bass with a few Amberjack. Finally some fishing to report! Weather warmed up a lot and winds died down to make for a really beautiful day. 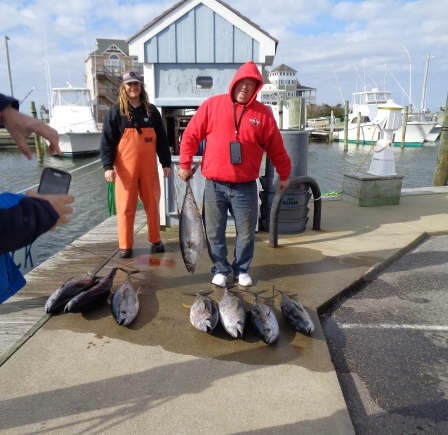 We had a couple of boats out fishing and they reported in good Blackfin Tuna fishing with a larger class fish, King Mackerel, Amberjack and Albacore. Sharks were thick today and several fish didn't make it to the boat but all in all not a bad day! What a surprising month January has been as far as weather is concerned! Everyone woke early Thursday morning to snowy conditions with accumulations anywhere from 3' - 6". It's rare to receive a snow day on the island, but businesses and schools were closed and most people built snowmen and went sledding! Temperatures in the mid 50's today has erased most of the cold, wet piles of snow. The weather is supposed to be milder for the next week or so, let's hope we can back to fishing again real soon. We had much warmer weather this past week, which help to thaw waterways and free the fleet. The water was extremely low in the Pamlico Sound making it impossible for the duck hunters to get out. A front moved through late last night bringing severe thunderstorms and wind gusts over 70 mph. The wind turned NW today bringing the water back in and duck hunters went out to the blinds. They returned with Pintails, Redheads, and Black Ducks. The Captains are getting restless - let's hope the weather continues to improve!